We’d love your help. Let us know what’s wrong with this preview of The Right to Write by Julia Cameron. To ask other readers questions about The Right to Write, please sign up. Как, собственно, эта книга? Я прочитала только Artist's Way, кое-что полезное для себя нашла. Does Ms. Cameron address keeping the flow together? Julia Cameron reminds me of Moses who once said, "I would that all men be prophets." When you come upon some great good, you wish it joyfully for anybody. There is a book inside each one of us that has yet to come out. We are all writers, without exception. Books require being written writing happens a sentence at a time. Sentences can happen in a moment, that is, enough stolen moments, enough stolen sentences, and a book is born- without the luxury of time. Get aggressive. Steal time. Julia has a proven excellent method called Morning Pages. Here we let ourselves get on the page and write 3 pages about absolutely anything, stream of consciousness. This will train our censor to step step aside and let us create. And as we write and write, writing "rights" things. Writing just wants to be written. Writing loves a writer and will fill our hearts if we let it. We make excuses and say, "But I'm not in the mood right now." Well, don't wait till you are in the mood. Write your first sentence and it could lead to a desire to go just a little further. I will just do it. I will just put my pen to the page and write, in the good days as well as the bad days. There are doors to be "closed" so I won't hear "small talk" on Facebook or waste away my emotional or mental energy. I have to guard my mind with a door that is really proof against the intrusions of others. Don't take your drama to others but keep the drama on the page; don't take it to Facebook, for instance. I don't want to be too tired, to distracted, too distraught to write. Therefore, I myself will slam the door; I slam the Iron Door. I refuse to engage in any drama except the drama that serves me and my purposes. Don't go around arguing with people but take to the page, write to "show them". I am going to turn the dross of my disappointment into the gold of accomplishment. Facebook, the net, etc. should be used as a reward because I first went ahead and did the work necessary. This is getting my life organized. A small comment here, a small comment there, too much depression, etc. all this can come to me in an email that I answer later in great detail and with great care, and not a comment here and there every 5 minutes. I should write with love. I should writing, knowing that someone will enjoy my writing specifically. So, I should write specifically to that someone. To you I write and YOU I cherish, dear reader. This will make my writing directed, focused and done with passion. My writing will become personal, focused and specific. Writing is an act of love, my way of worship too. I will perform it consciously, concretely and lovingly. Speaking of worship, as I write specifically, write detail by detail, there I will encounter God because God is in the details. There I will encounter more than myself and my own truth. I carry the idea of a book and God delivers to me bits and pieces as I need them. It is I who who will trigger this support as I experience some kind of lucid dreaming. God will lead me one thing at a time, bit by bit. I shouldn't think a whole book but think index cards. I should write by sketching. Get down the general shape of something first and then go back and fill in later. Try not to censor, or why in the world are we just encouraging the Morning Pages for?! Just put in what comes to you and you know that more will come later and that your first sketch will be a blueprint- and a prod- for finer and finer sketches, more and more detail. The writing will write through me, and so I will let it sketch through me. And "sketch" is the operative word. I will free myself to write. I am willing to write badly but I will write. I am willing to do the work, to finish this project whether it is good or not. When I am writing, I am "righting" myself. Writing makes things right. And when I am not "righting" myself, says Julia and I also, I slip into a gentle and sometimes not so gentle form of paranoia. I feel dislocated. out of synch. Out of sorts and out of step. When I write enough, I find myself interested by what I am saying. So, I empty myself on the page, in Christian terms, I experience my own kenosis. We are all works in progress. We are all rough drafts. None of us is finished, fine, done. Naturally we will have flaws, foibles and frills and fantasies, frailties that makes us human. That is the kind of books I could read over and over again as it is written from the heart, full of truth and it is subsequently to go straight to the heart and touch it. Each chapter of the book is on a different abstract concept related to writing such as "Mood" or "Voice" or "Making It", and each chapters ends with an "Initiation Tool," a writing exercise. The book reminds me of a combination of Lamott's Bird by Bird and Goldberg's Old Friend from Far Away because it combines thoughtful pondering on the practice as well as practical tools for the craft. Many of Cameron's writing assignments are about how you feel, however, encouraging you to draw a bath or take a walk, whereas Goldberg's exercises always take you to the page. I must confess that I prefer Goldberg's method more, since Cameron wanders a bit too far into the psychology of writing for my taste. I feel like Cameron is a cheerleader for people who want to write anything, including journals (which is great, just not where I am) whereas Goldberg is a cheerleader for people who need to write for other people to read. Does that distinction make sense? In terms of what I took away from this book, I appreciated it, but I did not find it as useful as Lamott or Goldberg. That fact may be a result of where I was in my writing when I read it - at a place where I wasn't following a daily practice - but I think the book also waxes esoteric a bit too much, making me lose my grounding in my own writing. Additionally, Cameron largely discounts the intellect in writing practice, and while I certainly know writing comes from a deeper place than from the mind, it's hard for me to see our knowledge and our understanding of the world intellectually as completely devoid of value in writing. All in all, this is a great book for people who need to get a daily writing practice started or for people who truly have great anxiety or fear about their writing (I have been both of those people and still am on some days). It may simply not be for those who are already writing and simply need someone to walk beside them. فکر کنم برای از سر گرفتن «نوشتنم» نیاز به سخنان جولیا کامرون داشتم که مدام بهم گوش زد کنه : « صفحات صبحگاهی بنویسید» «به سانسورچی درونتان عادت دهید کنار بایستد و تماشا کند.». 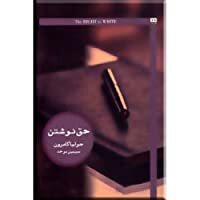 من این کتاب رو خیلی دوست داشتم و قطعا در فرصتهای بعدی بازخوانیش میکنم. نثر روانی داشت و ترجمهش هم بسیار روان بود. خوندنش رو به نویسندگان آماتور (که از روی عشق مینویسند) پیشنهاد میکنم. فکر کنم برای از سر گرفتن «نوشتنم» نیاز به سخنان جولیا کامرون داشتم که مدام بهم گوش زد کنه : « صفحات صبحگاهی بنویسید» «به سانسورچی درونتان عادت دهید کنار بایستد و تماشا کند.». من این کتاب رو خیلی دوست داشتم و قطعا در فرصت‌های بعدی بازخوانی‌ش می‌کنم. نثر روانی داشت و ترجمه‌ش هم بسیار روان بود. My review is biased, and there’s a story to go with it. As a result of my recent interest in Edgar Cayce, I have been reading some of his books to my utmost enjoyment. One day, I checked out his website where I saw a list of people somehow involved in or connected to the metaphysical world. One of the people profiled was Julia Cameron. I had never heard of her or her works. It seemed she had written quite a few books on writing, and I figured someday I’d get to reading at least one of them. I som My review is biased, and there’s a story to go with it. As a result of my recent interest in Edgar Cayce, I have been reading some of his books to my utmost enjoyment. One day, I checked out his website where I saw a list of people somehow involved in or connected to the metaphysical world. One of the people profiled was Julia Cameron. I had never heard of her or her works. It seemed she had written quite a few books on writing, and I figured someday I’d get to reading at least one of them. I somewhat ‘forgot’ about her until one day, when I just had the biggest urge to purchase this book, which I ended up doing. I have to say I am very glad I followed my gut and went for it, because this book is truly a gift for anyone needing to be reminded of the benefits of writing. Julia’s approach is laid-back and non-elitist, offering tactics for writers at all levels. She will motivate and inspire everyone to write, which I find very loving and non-judgmental in its approach. Those with a superiority complex will not like her work because it provides indiscriminate hope and encouragement to all. I am rather pleasantly surprised that I feel we both have the same spiritual outlook on writing; I often thought I was the only ‘weirdo’ who felt that writing has therapeutic effects. In fact I believe that’s why I would ever write in the first place, although I probably wasn’t aware of it at the time. Who would've thought I’d find such a supportive voice at such an opportune moment, and would do so through a deceased psychic’s website of all places?! But Julia has her mystical side too, as her chapter on ESP reminds us. That chapter just might be my favorite given that I’ve been reflecting on it recently, providing further reassurance to writers, if not to people in any field in general. This was a brilliant book. I love it. It was really affirming. The premise is simple: No matter what, just WRITE! Write your way to clarity and love. You can do it. The author believes in you. Note: the prompts in this book are pretty much exclusively for getting in touch with your keeping-a-journal, writing-about-your-own-experiences self. They're not prompts for fiction. The reason they're great, though, is because they connect you to that idea that it's good to write about everything, and that This was a brilliant book. I love it. It was really affirming. I expected to like this book more than I did, and I must say I'm glad I didn't buy another of Cameron's books which interested me (The Artist's Way) at the same time I bought this one. Having read The Right to Write, I think I can safely say that Julia Cameron's approach isn't really my preferred one. For me, the main problem with this book was how spiritual it was, which wasn't something I was at all expecting (and which may mean that others who are more sympathetic to this outlook will find th I expected to like this book more than I did, and I must say I'm glad I didn't buy another of Cameron's books which interested me (The Artist's Way) at the same time I bought this one. Having read The Right to Write, I think I can safely say that Julia Cameron's approach isn't really my preferred one. p207 (part of the exercise recommended for the ESP chapter, in which the reader is urged to write on several topics, including this one): Do you believe in God? Describe your belief or lack of belief. Is your God friendly to creative endeavours? Describe a God that could be. Once you allow for the possibility of such a benevolent force, you may begin to see evidence of one. I'm not saying the whole book is like that; there are many sections which aren't, dealing with more mundane matters like routine and places to write in and dealing with procrastination. However, this spiritual theme, and the idea of writing somehow channeling what a voice (your own? The universe's? I wasn't really sure), are both strong threads running through much of what is written. As an atheist myself, there's not a lot I can get out of ideas about writing as prayer or an exercise exhorting me to open my mind to the possibility of a god friendly to creative endeavours. This is why I suspect that others may find more to love in this book than I was able to - and may not find the occasional snarky comments about rationalism as irksome as I did. I have several other things more pressing to do this evening then finish reading a book, but I just had to finish Julia Cameron's "The Right to Write: An Invitation and Initiation into the Writing Life" because I just couldn't stand to read it anymore. At a short 230 pages, Cameron's book falls well within the range of a 'how-to on writing' book. The chapters were relatively short in length and ended with an "Initiation Tool" to get you on your way to a writing life. Both of these are good for w I have several other things more pressing to do this evening then finish reading a book, but I just had to finish Julia Cameron's "The Right to Write: An Invitation and Initiation into the Writing Life" because I just couldn't stand to read it anymore. At a short 230 pages, Cameron's book falls well within the range of a 'how-to on writing' book. The chapters were relatively short in length and ended with an "Initiation Tool" to get you on your way to a writing life. Both of these are good for writers who need inspiration, motivation, that allusive invitation, or just a swift kick to the seat of his/her pants to get them going. However, I would argue that this book could have easily been 50-70 pages shorter. She repeated herself way too much, often beating her points into the ground to the point where I just wanted to give up on the book and on her good intentioned invitation to a writer's life. And in the last chapter of the book, she suggested abolishing term 'writer' because everyone should write. Ugh! I am proud to be a writer! I identify as such and I resent any person (writer or not) who tries to take that away from me. Sure, Julia Cameron - you think that everyone is a writer. You're probably right, but not everyone does it. Morning Pages - three pages of stream of consciousness writing (written out in long hand) every morning. Narrative Time Line - A time line of important events in your life. Cups (taken from cupola, the cups gold diggers used) - An event that has spark or charge to it that you must expand upon. Artist Dates - taking yourself out to a place to replenish yourself, whether it be a museum, concert, festival, etc. I enjoyed her discussion on writing as it compares to other careers. No one questions people who aspire to be an investment banker or an elementary school teacher. Why should writing be any different. Are you a writer? Or a wannabe writer? Or just think maybe someday you might write something, if you have time and can get around to it, maybe? Then you might like this book. “We should write because it is human nature to write. Writing claims our world. It makes it directly and specifically our own. We should write because humans are spiritual beings and writing is a powerful form of prayer and meditation, connecting us both to our own insights and to a higher and deeper level of inner guidance. We should write because writing brings clarity and passion to the act of living. Writing is sensual, experiential, grounding. We should write because writing is good for the soul. We should write because writing yields us a body of work, a felt path through the world we live in. This book came to me highly recommended, by a fantastic author (Samantha Adkins) from my writer's group. It was giving her some great inspiration, and I hoped it would do the same for my own somewhat stalled writing. And it took forever and a day to read. That's mainly because I was taking the time to do (most) of the writing exercises in the book. There's one at the end of each chapter, and each chapter is only 4 -7 pages or so long, so that's a lot of exercising. Seriously. But it got me putting pen to page again, even if it was only making long, long lists in my journals all the time. These exercises though are more about getting you to think differently, rather than polishing your writing. That is not the goal of this book - it's goal is just to get you writing. To get over the obstacles that keep you from being creative and get you to put it down, even if it's bad! Even if it's silly! Even if it's not worth the paper it's on - because in the end, it is worth it, because it got you moving again. I've published a couple of the writing exercises on my blog. You can check out 100 Things I Love, and Fifty Bits of Happiness, and watch for a few more that are scheduled for future weeks in the Written Arts category. I found this book to be useful, but I also found it to be a little bit "Look how great my life is"-ish. What I mean by that - and by no means am I bemoaning Julia Cameron's success, because I mean, good for her - is that there's only so much I can take of how beautiful your ranch is and how sweet your horses are and how cool your car is and how easily you dash off movie scripts before I roll my eyes. Maybe that's partly jealousy/envy on my part. What this book is really about, is freeing you from your thoughts of what a writer should be, should do, should produce and getting you to just see that if you want to be a writer, then you are a writer. You don't need permission. You don't need validation. You don't need to be published. You don't need anyone else to like your writing. You just have to write, because that's all that makes a writer. I really like that attitude, and that belief system. I don't like her emphasis on writing by hand. I can't write with my hands nearly fast enough to capture all the stuff that falls out of my head. I just can't. I love to journal but having that pressure to do it all by hand kills it for me. So I'm taking a page out of her own book (hah) and doing it how it works for me. Cause I don't need anyone else to tell me how to write - even the writer who told me that. "Writing--and this is the big secret--wants to be written. Writing loves a writer the way God loves a true devotee. Writing will fill up your heart if you let it. It will fill your pages and help you fill your life." In the midst of the huge learning curve that has been the publication of my first independent work, it was incredibly gratifying to be reminded of the reasons that I write -- not for publication or attention or fans (although those things are all lovely!) but because of the way it no "Writing--and this is the big secret--wants to be written. Writing loves a writer the way God loves a true devotee. Writing will fill up your heart if you let it. It will fill your pages and help you fill your life." In the midst of the huge learning curve that has been the publication of my first independent work, it was incredibly gratifying to be reminded of the reasons that I write -- not for publication or attention or fans (although those things are all lovely!) but because of the way it nourishes my soul. 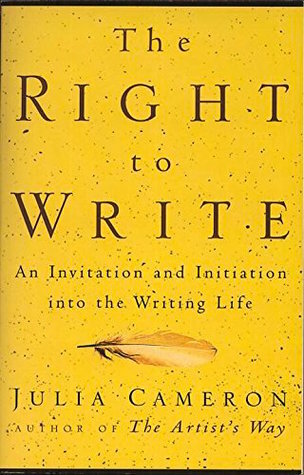 The Right to Write was recommended to me by a good writer friend when I posted a wishlist of books relating to Writing as a Spiritual Practice, and this was a really lovely start to reading through that pile. I recently described Paulette Bates Alden's book, "Crossing the Moon," as "nourishing," and I can only use the same word to describe "The Right to Write." My writer's soul drank up Julia Cameron's encouragement and affirmation like South Dakota soil drinks up rain in its drout years. Each essay contained wonderful advice and beautiful reminders about the things we know, deep down, about our writing: that it matters to us, and even to the world, regardless of who sees it or how they react to it. I appreciated its focus squarely on writing as a process rather than a product, and its ability to separate the two without denigrating either one. In some places the essays felt a little meandering or even self-satisfied, and yet, this is a style that "works" for a book about letting writing flow to you and through you. And despite that, this book is not "rough" in any way -- one can see the creative whir beneath the finished product, and yet the finished product is still, indisputably, polished. I haven't yet done any of the writing exercises ("initiations") at the end of each chapter, but I feel confident that sinking into them when I'm finished writing from "A Year in the Life" will give me an even deeper appreciation for this book. Right up there with Natalie Goldberg's Writing Down the Bones this book is inspiring and motivational, while at the same time practical and helpful. I appreciate the clarity of her approach to guiding a new writer, or just a writer who is having trouble finding their way. Most of all I appreciated her constant reminder that to be a writer is just to write. Period. I highly recommend this to anyone who is looking for a helpful nudge on their writing journey. I love this book. It is my writing bible. Ця книга здалась мені набагато легшою для слідування і сприйняття ніж Шлях Митця (але звісно вона більш вузькоспеціалізована). Кожен розділ охоплює якусь конкретну проблему, яка заважає нам писати вільно і легко, і потім подається рекомендована письменницька вправа. Дуже круто. Якщо коротко: пишіть багато і все буде. Overall, I think Cameron has it right. This book is written in a series of essays and usually starts out with her location - a beautiful mini paragraph where we as readers are watching her horses, the clouds, lighting, sunsets, sagebrush, etc. As a lover of the southwest, it was a great recurring image throughout the book. Her last essay, in particular, is my favorite. It sums up the book but also the title, the right to write. It talks about the idea that all writing can be "amateur" and, in man Overall, I think Cameron has it right. This book is written in a series of essays and usually starts out with her location - a beautiful mini paragraph where we as readers are watching her horses, the clouds, lighting, sunsets, sagebrush, etc. As a lover of the southwest, it was a great recurring image throughout the book. Her last essay, in particular, is my favorite. It sums up the book but also the title, the right to write. It talks about the idea that all writing can be "amateur" and, in many ways, professional. The idea of the book is to get off your high horse and just write something already - an idea I've heard time and time again from successful writers and one I believe myself. So, yes, I liked this book, but I'm not as gaga over it as I am Goldberg's Writing Down the Bones: Freeing the Writer Within (easily my favorite book on writing). There were two things in particular about this book I felt just didn't flow. 1) It got repetitive: many of the essay themes are similar and Cameron refers to many of the same events in her life. I understood this book isn't necessarily meant to be read front to back, but I ate a lot of it up in one go and I feel many of the essays could have been combined. 2) It really didn't make me want to write. Reading Goldberg, or even Cleaver's Immediate Fiction: A Complete Writing Course, I stopped reading to jot something down, inspiration striking. This book, even with the added prompts, just didn't get me inspired to write. 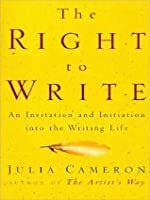 Julia Cameron's "The Right to Write" is more of a writing philosophy work rather than a "how to" book. I actually really liked reading her anecdotes on the writing life and what her experience and advice entailed. I liked her approaches to several different topics, including procrastination, writer's block, the drive to write, among others. And one of the things I really appreciated in this novel is that she completely knocks down the myth/fabrication of what some term as "real" writers versus n Julia Cameron's "The Right to Write" is more of a writing philosophy work rather than a "how to" book. I actually really liked reading her anecdotes on the writing life and what her experience and advice entailed. I liked her approaches to several different topics, including procrastination, writer's block, the drive to write, among others. And one of the things I really appreciated in this novel is that she completely knocks down the myth/fabrication of what some term as "real" writers versus not. She simply states, somewhat paraphrased: if you write, you are a writer - we are all, in essence, writers of different walks, it's what we choose to do with it and keeping it in practice. She breaks down a lot of mental barriers that writers might have in the process, and she does so with a reassuring, calm voice that carries itself through each topic and page. I liked thee exercises at the end of each chapter that puts into practice some of the ideas she expounds upon, but really what I got most out of this book were her respective ideas to the writing life, building confidence as a writer, and just how to keep going with ones passion for it. It was a good work, I liked it quite a bit. If I could say one constructively critical thing on it, however, there are places in this where it does tend to meander a little, but I didn't find that to be a deterrent of what I was able to get from this book, and I would certainly return to it again. Julia Cameron certainly makes one feel like they should write, often and without hesitation. Essentially, she holds up the banner of writing for the sake of writing, not for publication or profit. It's therapeutic. It teaches us to be better communicators and human beings. It's spiritual. It invites us to be creators rather than spectators. Cameron captures a certain passion that makes the reader hungry to break out pen and journal. There are moments of navel gazing and self-congratulatory passag Julia Cameron certainly makes one feel like they should write, often and without hesitation. Essentially, she holds up the banner of writing for the sake of writing, not for publication or profit. another book i've been reading on and off for years. great to have on hand for those times when the closest i can get to writing is reading about it. also the essay format is perfect for when i can't commit to anything (i.e. writing). I recently finished reading The Right to Write - An Invitation and Initiation into the Writing Life - by Julia Cameron. As best summarized by the author: " What this book will do, if I have done it well enough, is t talk to you about writing for the sake of writing, for the sheer unadulterated joy of putting words to the page. In other words, this is less a " "how to" book than a "why" book. Why should we write? We should write because it is human nature to write. Writing claims our world. It ma I recently finished reading The Right to Write - An Invitation and Initiation into the Writing Life - by Julia Cameron. As best summarized by the author: " What this book will do, if I have done it well enough, is t talk to you about writing for the sake of writing, for the sheer unadulterated joy of putting words to the page. In other words, this is less a " "how to" book than a "why" book. Why should we write? We should write because it is human nature to write. Writing claims our world. It makes it directly and specifically our own. We should write because humans are spiritual beings and writing is a powerful form of prayer and meditation, connecting us both to our own insights and to a higher and deeper level of inner guidance as well. We should write because writing brings clarity and passion to the act of living. Writing is sensual, experiential, grounding. We should write because writing is good for the soul. We should write because writing yields us a body of work, a felt path through the world we live in." As a result, most of us try to write too carefully. We try to do it "right." We try to sound smart. We try, period. Writing goes much better when we don't work at it so much. When we give ourselves permission to just hang out on the page. For me, writing is like a good pair of pajamas—comfortable. In our culture, writing is more often costumed up in a military outfit. We want our sentences to march in neat little rows, like well-behaved boarding-school children. If we eliminate the word "writer," if we just go back to writing as an act of listening and naming what we hear, some of the rules disappear. There is an organic shape, a form-coming-into-form that is inherent in the thing we are observing, listening to, and trying to put on the page. It has rules of its own that it will reveal to us if we listen with attention. Shape does not need to be imposed. Shape is part of with attention. Shape does not need to be imposed. Shape is part of what we are listening to. When we just let ourselves write, we get it "right." Not writing is the lonely thing. Not writing creates self-obsession. Self-obsession blocks connection with others. Self-obsession blocks connection with the self Writing is like looking at an inner compass. We check in and we get our bearings. Ah-ha! I am feeling, thinking. remembering. . . . When we know accurately what it is that we are doing, we tend to be more open, accurate, and affectionate in our dealings: I can miss David, but I can't blame David anymore. I am the one who didn't write enough yesterday. People who write out of "discipline" are taking a substantial risk. They are setting up a situation against which they may one day strongly rebel. Writing from discipline invites extremism: "I have to do this or I'm a failure." Writing from discipline creates a potential for emotional blackmail: "If I don't write I've got no character." People who write from discipline also take the risk of trying to write from the least open and imaginative part of themselves, the part of them that punches a time clock instead of taking flights of fancy. "Commitment" is a word I prefer to the word "discipline." It is more proactive, more heart-centered, and ultimately more festive and productive. This is not mere semantics. If we are to be involved with writing for the long haul, we want to be comfortable in relationship to it. If we are relating to our writing as a "should" instead of as a desired good, we run the jeopardy of experiencing our writing connection like a thankless marriage: we're there, but we don't want to be. We're thinking of what we're missing. We are all works in progress. We are all rough drafts. None of us is finished, final, "done." How much healthier and happier if we ignore that mafioso's advice to me and we put "it"—all of "it"—in writing: the flaws, foibles, frills, fantasies, and frailties that make us human. When we connect these dots, we connect. I like writing to be more portable and flexible. I like writing to be something that fits into cracks and crannies. I don't like it to dominate my life. I like it to fill my life. There is a big difference. When writing dominates a life, relationships suffer—and, not coincidentally, so does the writing. When writing is about being shut off" from the world in a room sequestered with our own important thoughts, we lose the flow of life, the flow of new ideas and input that can shape. improve, and inform that thought. It is a matter of balance. Yes, we need time and space to write, but we do not perhaps need as much time and as much space as we might think. Rather than being a private affair cordoned off" from life as the rest of the world lives it, writing might profitably be seen as an activity best embedded in life, not divorced from it—of course such a view of writing smacks of heresy. The root of the word "integration" is the smaller word "integer," which means "whole." Too often, racing through life, we become the "hole," not the "whole." We become an unexamined maw into which our encounters and experiences rush unassimilated, leaving us both full and unsatisfied because nothing has been digested and taken in. In order to "integrate" our experiences, we must take them into account against the broader canvas of our life. We must slow down and recognize when currents of change, like movements in a symphony, are moving through us. In those, and most professions, we assume that an interest in pursuing the career implies a probable proclivity for it and a reasonable chance for success. Not so with writing. The truth is, when you want a writing career and are willing to do the work to get it, the odds work with you, not against you. This is simple metaphysical law. As Goethe advised us, "Whatever you think you can do or believe you can do, begin it—for action has magic grace and power in it." "Scrutinize second," I laid down a rule for myself "Write first and freely." 1. Write daily, even if only Morning Pages. 2. Use tools like Media Deprivation and Blasting Through Blocks to give you a jump-start 3. Watch your telephone consumption. 4. Watch your note production. 5. Set a clock for one half hour's writing time. Pray for the willingness to write—and then write. "Thou art truly human." To be truly human, we all have the right to make art. We all have the right to write. This is a tough rating for me. I've been reading this book off and on since April, nearly 6 months. Along the way, I've contemplated giving up on it several times, only to hit a chapter that really spoke to me, encouraging me to keep reading. I'm finally DNFing now, only a handful of chapters from the end, because it occurred to me that I'm just not enjoying it anymore. That said, some of the chapters in this book were truly powerful. They made me think. They changed the way I write and view my w This is a tough rating for me. Как и многие другие подобные книги, эта практически построена на вдалбливании каких-то конкретных идей многочисленными повторами примеров и аргументов. Только здесь вместо того, чтобы говорить - ты можешь бросить пить, курить или жрать тонны еды - ты имеешь право писать, никто не имеет права тебя судить, и вот тебе пара советов как просто брать и писать вместо того, чтобы думать о том, как это было бы классно. Последние три-четыре статьи в книжке в этом плане вполне конкретны и прагматичны. I have turned to this book off and on ingesting it in short bits. If you liked her The Artists Way then you will also like this. I didn’t enjoy that sacred cow Bird by Bird as Lamott always had an underlying negative tone. Julia Cameron on the other hand provides positive thoughts, suggestions, and ideas to the writer that is open to all. Very few books do I keep after I’ve finished reading them. This one will stay on my shelf because I think I could pick it up any day, open to a random page, and feel inspiration. I might read the whole thing through again some day too. 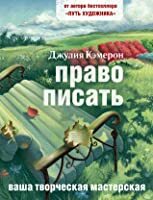 Очень хорошая книга! Легла на мое мировоззрение. Всем, кто хочет писать - рекомендую. A book that inspired me to write every day. As she pointed out, everyone can be a writer, all you have to do is write. Don't worry about getting published, start by expressing yourself. The exercises in this book were helpful. I couldn't do most of them because I had only checked out this book from the library but I plan to pick up my own copy and spend some time working through the couple month's worth of exercises. Неожиданно не водянистый, искренний и содержательный разговор о писательстве как об универсальном способе добиваться в себе и для себя многого полезного. рискну рекомендовать любому, кому нанизывать слова доставляет хоть какое-то удовольствие. I worked on the exercises with my friend, Suzanne, and learned a lot. Julia Cameron is as usual an excellent writer. И помнить о том, что лучшие миры легче всего сначала сделать на бумаге.